This retrospective exhibition spans the diverse career of 20th century Swiss-French architect and renaissance man Le Corbusier, (1887–1965) whom many view as the ‘father of modern architecture.’ Not only does it feature intriguing examples of Le Corbusier’s major architectural works via drawings, models, interior settings, dioramas and photographs, but also on display here are selected examples of his furniture designs, paintings, sculptures, tapestries, films and writings, along with drawings and paintings by some of his chief creative influences, among them, Pablo Picasso, Juan Gris, Piet Mondrian and Fernand Légar. 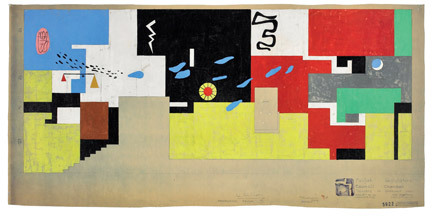 Charles-Eduard Jeanneret-Gris first adopted the pseudonym Le Corbusier, meaning “crow-like one”, in his adopted home of Paris in 1920 for the first issue of L’Esprit nouveau, a magazine he founded with disillusioned Cubist painter, Amédée Ozenfant. 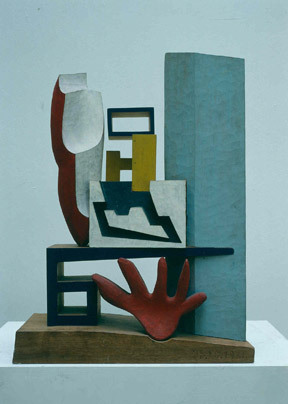 In terms of painting, Le Corbusier is best known as one of the founders of the Purist movement, drawing on basic forms inspired by modern machinery. 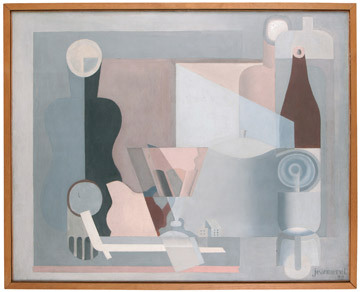 He and Ozenfant founded Purism in response to Cubism, which they both considered passé, largely due to its increasingly decorative aspects. To move through this exhibition is not only to move through time, but also, through space, in terms of how it was perceived and put to use by Le Corbusier. However, rather than detail his artistic process in purely chronological terms, the exhibition guides viewers along through three sections, each of which sheds light on various aspects of Le Corbusier’s artistic evolution and career. The first section, ‘Context,’ focuses on that aspect, as it applies to his pre 1945 work. In the opening room, a beautifully constructed, architecturally inspired writing desk with arch shaped cubbyholes, squared dollhouse trinket drawers and gracefully tapered legs greets us. It is a Secretary bureau Le Corbusier designed especially for his mother in 1916, made of Pine in the Sapin style, which was the local Swiss variety of Art Nouveau. It was the first piece of furniture Le Corbusier ever designed and it displays a great sense of form and style within its pared down architectural details. In this section of the exhibition, we also become aware of the architect’s understanding of the way light passes through and around shapes, as demonstrated by a model of the lovely Villa Jeanneret (1912), designed and built for Le Corbusier’s parents, the upkeep of which quickly proved too costly for them to maintain. To a certain extent, his rather brazen suggestion that the historic centre of Paris be flattened and replaced by a series of identical tower like structures of his own design, was a self-promotional manoeuvre which no doubt amused as many people as it inflamed. 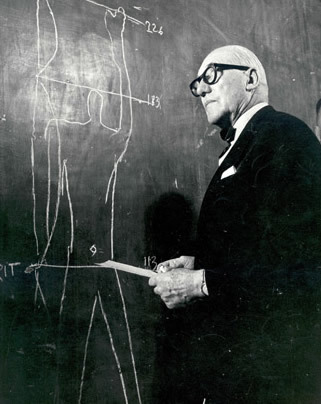 However, as would be the case with some of the other projects Le Corbusier proposed through the course of his career, his initial proposals were often on a much grander scale than was actually feasible. His design for a harbour-hugging series of structures with an undulating accompanying road in Algiers, envisioned as a replacement for the existing ancient harbour, for example, resulted in the construction of a single large building, albeit one which reflected his interest in Islamic culture. The building, with its trademark windows of many different shapes and sizes, was made all the more practical by a technique whereby actual ‘windows’ (in reality a wall of glass with an overlay) were sunken within their ‘frames’ to allow for shade inside, against the searing sun, without sacrificing views. The design was both ingenious as well as practical. Such considerations, which definitely impacted favourably upon the building’s inhabitants, were always of great interest and concern to Le Corbusier, who believed that such things as views, greenery, light and space were the natural rights of everyone, rich or poor. In the next section of the exhibition, ‘Privacy and Publicity,’ mass and form become matters of greater focus, as one begins to appraise the impact of some of Le Corbusier’s best known works. 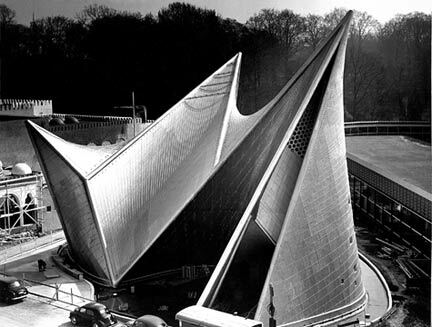 Among them is the Phillips Pavilion, a distinctive building which spanned its space at the 1958 World’s Fair in Brussels like a huge angled bat, housing, within its eye-catching structure, something even more ground-breaking for its time - the first ever multi-media show, pairing a black and white film by Le Corbusier, with avant-garde musical compositions by the project’s leading architect, Yannis Xenakis and composer Edgard Varsey. Apparently, viewer reactions to this innovative display ranged from disgust and excitement to fear, but its influence remains undisputed. 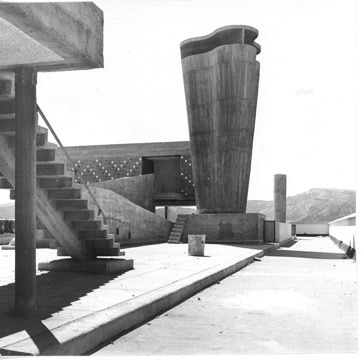 Xenakis left Le Corbusier’s employ after ten years of collaborations, as his contribution was not sufficiently cited , as the Phillips Pavilion was being razed to the ground at the conclusion of the World’s Fair, a mere five months after its opening. 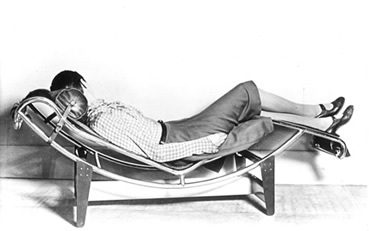 As intermittently indicated throughout the exhibit, Le Corbusier always displayed a strong sense of urbanism, believing that as an architect, he could be instrumental in the creation of new ways of city dwelling which might be more conducive to well-being while remaining cost effective. After years of deliberation and planning, Unité d'Habitation in Marseille (1947-52) housing 1,800 people demonstrated his ideals with its generous allowances for light, green space via a rooftop garden, and room for rearranging ‘rooms’ via its apartments’ open floor plan. As coincidence would have it, while we were admiring the imaginative, yet functional design of one of the actual kitchens from Unité d'Habitation, a man came along who had actually lived in that building for ten years and had found the experience, ‘wonderful,’ as one could just move in, with ‘a suitcase,’ and start living there. As he photographed the kitchen from various angles, he added that his daughter, who was small when they’d lived there, had since gone on to become an architect. That original complex would be the first of several such buildings, with others in Nantes-Rezé, (1952) and other locations in France, in the ‘50’s and ‘60’s and another in Berlin - Charlottenburg (1957). Who could foresee then that in future, Le Corbusier’s humanitarian ideals would be diminished to the point of non-existence with the careless construction of social housing projects loosely based on his exterior architectural designs, with none of their interior humanitarian concerns taken into account, as evidenced by notorious housing projects in Britain and the USA in the 1960’s and beyond, many of which became crime ridden eyesores. It might also be said here that Le Corbusier inadvertently initiated the idea of self-contained living prevalent in today’s ‘luxury flat’ phenomena, as his original apartment complex featured a school and shops as well as its own outdoor theatre. 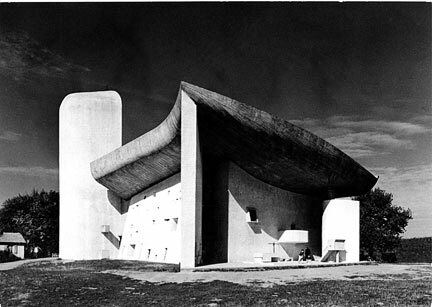 However, Unite d’Habitation embodies the Five Points of Architecture Le Corbusier had been developing throughout the 1920’s and described in his book (still the best selling architecture’s guide) Vers une architecture. Firstly, the bulk of the structure is supported by pilotis or reinforced concrete stilts, allowing for the next two points – a free facade/ non-supporting walls which could be designed in any manner the architect desired, and an open floor plan leaving floor space free to be made into rooms without concern for supporting walls. Le Corbusier’s designs are also, often noted for the last two points - long strips of ribbon windows allowing for unencumbered views and roof top gardens offering green space to compensate for the land taken up by the building. Add solar panels, windmills, and the capacity for recycling water and waste to this plan, and you’ve effectively got a recipe for greener city living! The final section of the exhibition, ‘Built Art,’ offers a chance to appreciate the realisation of one of Le Corbusier’s largest scale projects that of the redesigning of Chandigarh, India where his buildings, with green spaces in between, were constructed 1952-1959. This grouping included a Palace of Justice, Museum and Gallery of Art, Governor’s Palace, Government College of the Arts and appropriately, Chandigarh College of Architecture among other buildings. It is when one looks at the accompanying photographs and reads the text in this section, that Le Corbusier’s influence really hits home, despite differences in locales. Here was a man whose influence not only enhanced the skyline of cities, but the lifestyles of their people as well, as his buildings were built with not only care and consideration for those who would be using them, but also, for those seeking natural sanctuary in the green spaces surrounding them. This was modern planning before long green thinking took hold, and yet it fairly hums with the harmony of its inner and outer aesthetics! Perhaps we allegedly modern men could do with a little more adherence to the voice of history via a bit more of Le Corbusier’s inherent appreciation of nature, in terms of light, space and greenery. Moving onto a series of aesthetically pleasing, interlocking wooden sculptures designed by Le Corbusier, crafted by carpenter, Joseph Savina, one ponders these thoughts. 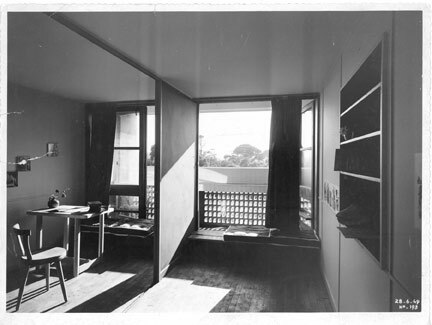 However, perhaps the most telling aspect of the exhibition of all is a photograph of the great architect contentedly drawing in his own version of the ideal space -his cabanon, the tiny, one-roomed wooden hut he designed himself and had built by local carpenters on the Côte d'Azur, where he spent every summer from 1952 onwards. For him, it contained everything necessary – a bed, a table, and bookshelves, despite the fact that it measured just 1.9 x 4 metres. In the face of reoccurring arguments that Le Corbusier might be responsible, in some way, for the degeneration of urban cities via low budgeted social housing projects hurriedly built, without thought, allegedly, to his more thoughtful designs of years before, one might want to consider his own dwelling of choice, which is surely, a sign of the humility of the man himself. As Kate Bush, Barbican Art Director stated in her introduction, Le Corbusier and his ‘brut’ style of architecture was the ‘guiding spirit’ for the Barbican Centre’s architects, Chamberlin, Powell and Bon, and this exhibition has been designed to demonstrate his ‘sense of fluidity across all art forms,’ which, it does. However, there is much more to consider in this exhibition, not only in terms of sense of place and interior versus exterior, but also, in relation to the sheer nerve, determination and vision of Le Corbusier himself. This is the first exhibition about the ‘father of modern architecture’ in twenty years, and given the expansiveness of his creative repertoire and influence, both during his lifetime, and after, it’s about time. Open Tues-Wed 11am-6pm, Thurs 11am-10pm, Fri-Mon 11am-8pm. Admission £8, concs £7.